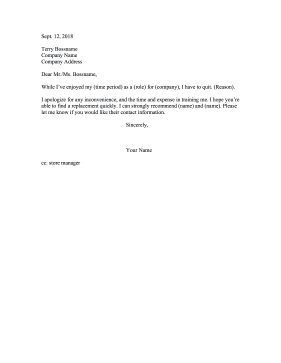 Use this letter template to explain that you are quitting a job you recently started. It includes language for recommending a replacement. This letter is especially relevant to lower-level retail or food service positions. While I've enjoyed my (time period) as a (role) for (company), I have to quit. (Reason). I apologize for any inconvenience, and the time and expense in training me. I hope you're able to find a replacement quickly. I can strongly recommend (name) and (name). Please let me know if you would like their contact information.